A New Jersey community is paying its respects after a father and all his children were killed in a crash. Rana Novini reports. Days after a pickup truck for some reason crossed a median in Delaware and smashed head-on into a vehicle carrying a family of six from New Jersey, killing all but the mother, no charges have been filed. And as authorities try to figure out exactly what went wrong, a community is grappling with how to support the badly hurt mother who just lost her four daughters and her husband. 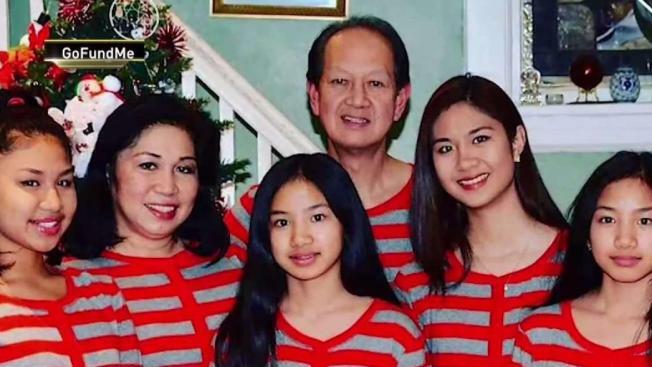 The crash Friday afternoon killed 61-year-old Audie Trinidad and his daughters 20-year-old Nikki, 17-year-old Danna and 13-year-old twins Allison and Melissa. Trinidad was a postal carrier, his wife a nurse, distraught relatives told News 4. The girls' mother suffered serious injuries in the crash, including broken ribs and knees, according to NJ.com, but she is expected to survive. What kind of life is ahead of her, though, remains uncertain after such a loss, relatives say. "I don't understand why these things happen. The whole family wiped out in the blink of an eye," said Trinidad's brother Daniel. "I don't know how my sister-in-law will take this. She's the only one who survived." The pickup truck driver was identified over the weekend as 44-year-old Alvin S. Hubbard Jr. of East New Market, Maryland. Authorities say he veered across a grassy median on Delaware Route 1 through Townsend and into northbound traffic, police said. It struck the family's minivan head-on; they had been heading back to their home in Teaneck from a stay in Maryland. The oldest daughter had just graduated from college and Danna was going to be a senior in high school. The twins would have entered eighth grade. Police said the investigation into the cause of the crash is ongoing. Detectives did not release a preliminary cause. "It’s certainly heartbreaking as you can imagine, those of us that have families and children, I mean, I feel so bad for this family. I can’t imagine what they’re going through," State police Master Cpl. Melissa Jaffe said.